India Easy Trip Pvt Ltd is provides completely customized and private sightseeing tours in Rishikesh and near by areas. 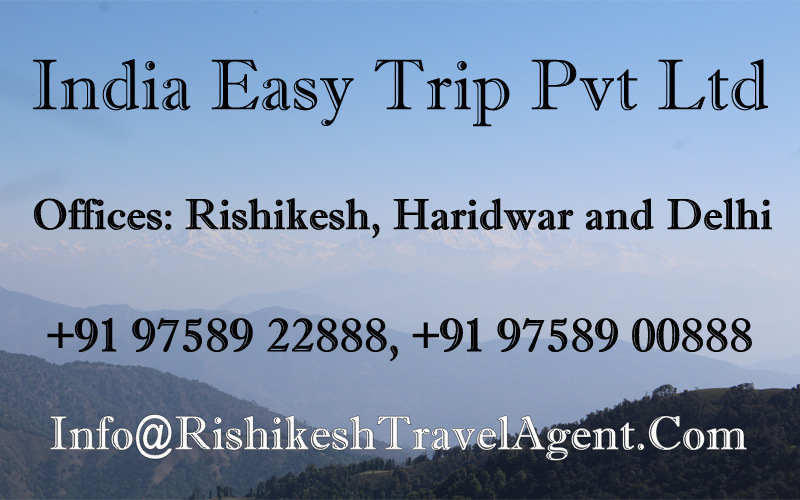 Most of the other travel agents are promoting and selling only adventures in Rishikesh but at India Easy Trip we believe that the city has a lot more to offer than just adventure. We invite you to see Rishikesh from our eyes. For us sightseeing is not just visiting places it is a lot more than that. At India Easy Trip we believe in value for money. Our sightseeing tours are just a little costlier than others (not too much) but we ensure that you will get 100 % value for money. Our all day tours below are private & guided. We ensure you that in these tours our guides will not take you to any commission based shops and waste your time. You can read about suggested tours below but we are flexible and knowledgeable enough to create customized tours at short notice. Cultural walk is unique tour for culture lovers. This walk is total 5 kms walk. First our guide will meet you at Lakshman Jhula Parking in afternoon at 13:30 hrs. We will visit Lakshman Jhula, Market, Shwargashram, Ram Jhula, Gita Bhawan and Parmarth Niketan. At last we will see Ganga Aarti at Parmarth Niketan. After the Ganga Aarti we will drop you at Ram Jhula Parking. Cost Includes: Professional English speaking guide, all monument fees. Note: Govt Service Tax 5 % Extra. Lunch is not included in cost. Transportation is not included in the cost. This is best option of tour if you have only one day in Rishikesh and you want to visit the best in city. This full day sightseeing tour includes visit to Bharat Mandir, Sivananda Ashram, Vashitha Cave, Lakshma Jhula, River Ganga, Ram Jhula, Gita Bhawan and Parmarth Niketan. Evening you can enjoy ganga aarti at Triveni Ghat. Cost Includes: All transfer by ac car, professional English speaking guide, all monument fees. Note: Govt Service Tax 5 % Extra. Lunch is not included in cost. Pick up and drop is included in the cost for all hotels inside city. Haridwar is pilgrimage town near Rishikesh (just 30 kms far). Haridwar is very old town. It is very popular to hindu religious people and busy town compare to Rishikesh but it is worth to if you are interested in culture. This sightseeing tour includes visit to Jain Temple, Shantikunj Ashram, Pawan Dham, Mansa Devi Temple, Bara Bazar and Har Ki Pauri. Evening Ganga Aarti is also unique experience here. Note: Govt Service Tax 5 % Extra. Lunch is not included in cost. Cable Car cost is not included. Pick up and drop is included in the cost for all hotels inside city. Devprayag is town from where the River Bhagirathi and the River Alaknanda is meeting each other. After this confluence the river is officially known as River Ganga. Devprayag is 80 kms far from Rishikesh. On the way you can see Vashitha Cave (meditation cave used by sage Vashistha). Through out the way you will see amazing river ganga flowing in the mountains of Himalaya. At Devprayag we will visit Raghunath Temple and The holy confluence. Mussoorie is hill station 120 kms far from Rishikesh. First we will visit two temples from where you can see amazing view as well as you can visit holy temples. Kunjapuri Temple and Surkannda Devi Temple. Later on the way to Mussoorie you can see beautiful mountains of Himalaya. Later at Mussoorie we will visit Mall Road and Gun Hill. After that we will return to Rishikesh. This tour is to explore the places little far from the Rishikesh. Our first destination will be sunrise visit at Kunjapuri Temple. We need to start early to reach this temple before sunrise (25 kms far from Rishikesh). The temple provides amazing view of himalaya. Later you will trek through the villages and farms for 9 kms. The trek is beautiful trek. At the end of the trek you will reach Neergaddu waterfall. You can also take bath here for refreshment. At the end our car will meet you and take you to Rishikesh. At the end of the trek our car will pick up you and drop you at your hotel. Rishikesh is surrounded by Rajaji National Park on three sides. Rajaji National Park is Elephant reserve. Chilla range is just 25 kms far from Rishikesh. At Chilla Range we will provide jungle safari in open jeep. Professional Jungle Safari Guide will be provided. Jungle Safari is circuit of 35 kms. Two options are available morning and afternoon safari. Timing is different in winter and summer. Park is closed from June to October. Rafting is also good option to view the Rishikesh from the middle of River Ganga. Rafting is open from September to june. At India Easy Trip we focus on overall experience. Most of our rafting are personal so you don’t need to adjust with others. For single person or couple we use sharing basis rafting but we ensure that our guest will get proper attention, safety and fun. We prefer private rafting for small groups for best experience.